The path to measurable marketing success begins with an accurate view of your customers and prospects. 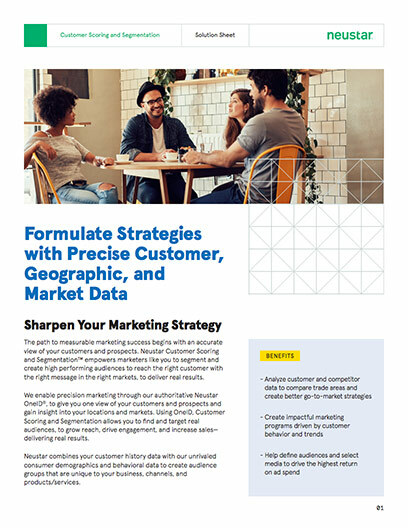 Neustar Customer Scoring and Segmentation™ empowers marketers like you to segment and create high performing audiences to reach the right customer with the right message in the right markets, to deliver real results. We enable precision marketing through our authoritative Neustar OneID®, to give you one view of your customers and prospects and gain insight into your locations and markets. Using OneID, Customer Scoring and Segmentation allows you to find and target real audiences, to grow reach, drive engagement, and increase sales— delivering real results. Neustar combines your customer history data with our unrivaled consumer demographics and behavioral data to create audience groups that are unique to your business, channels, and products/services. Customer Scoring and Segmentation is built on a robust set of segments. These segments are far more homogeneous than standard off-the-shelf consumer segments, which means that households in each segment are more likely to exhibit similar behavior than with one-size-fits-all segments. Using your customer transaction, campaign history and/ or survey data, combined with our unmatched coverage of household-level customer demographics and behavioral data, Neustar determines which elements exhibit similar behavior when interacting with your business. Neustar rolls up the segments based on those that perform well with your brand or business, and uses them to create custom segments. These segments are more predictive of your target audience’s behaviors because your specific customer attributes are used in the model. These tactical segments can be rolled up to 8-10 strategic groups that are typically used for market research, messaging, product marketing and creative development. What is Neustar Customer Scoring and Segmentation? Market and site analysis - Customer Scoring and Segmentation can drive site and market analysis with accurate and up-to-date data, enabling you to analyze market share data. Media and channel planning - Customer Scoring and Segmentation can also inform your media and channel planning by helping you figure out your high performing audiences and how best to build lookalike audiences, and then select media that would provide the maximum ROI for those audiences. It comes with an easy to use web interface that is customizable to your enterprise’s needs—this is available either through a self-serve model or as a professional services engagement. With this robust data at your fingertips, you can reach new customers by understanding their media-consumption patterns and locating them geographically. Customer Scoring and Segmentation gives you the insight to deliver the message or offer to those most likely to drive a profitable response, boost your conversion rate and generate revenue. This solution can also be applied by geography for market-size and penetration analyses. Neustar can provide the number of households for each of your audience groups in any census, postal or custom geography. Customer Scoring and Segmentation helps enrich your customer data with authoritative data to guide strategic marketing, messaging, creative development and media buying—helping you increase ROI, reduce time to market, and build high performing audiences, all while protecting your business with our privacy by design foundation.